I'm working on the start of a new RR. As you may know, we've had a hard time finding villages in some of our worlds, lately--the ones with the smaller biomes. I found this application online that helps find villages, but it only works in default type worlds. (The guy also makes apps for finding other things in MineCraft. So tonight I started a regular world that actually spawned me, originally, in a jungle, so I know there's one of THOSE there, and with the seed, I can easily get the coordinates for it, if we need it. I fed the seed into the Village Finder app, and then looked for a string of eight villages that were fairly close together, then I investigated and found six of the eight to be pretty much where they were indicated in the Village Finder app. In that original map, I went into creative and then teleported to all the coords, found the villages, then made an "address" for each village (by landing on a central street), noted some problems with each village, took some pictures (see below), and then deleted that world and created a new one from the seed. All the while, I was thinking how to make this work as a shared world. To see how big the file would be if I teleported directly to the first village in the line (after picking up my bonus chest), I did that. The file was only 17.5 MB after doing that, which is good, because the village is quite a long way away from the original seed. I then set the world spawn to the address of Village #1. It still is the same size even after I've fixed up about half the village, so far. Then I started fixing up the village and getting it ready for the next step. Here's what Village #1 looked like when I took it's picture earlier (it's the BEFORE picture). Later, you'll see the AFTER pictures. Here are the other five villages, as I found them in the natural. As mentioned they all have varying degress of both good and bad things. When I post the actual file, after I finish Part 1, I'll elaborate on those things, and give all the coordinates...NOT to be teleported to, but to have roads built to. Village #1 has no farms, no library, no forge, two butcher shops, three of the big houses, and quite a few of the little farm huts. It also has LOTS of librarians (six or seven of them, I think. When I finish fixing up and protecting Village #1, I will make a road to Village #2 (village to village), and will take a gift to them, in payment for the books from one of their two libraries and a couple of carrots and potatoes from their very nice farms. I'll leave my gift in a special chest near their well, for the next player to use the map to pick up. 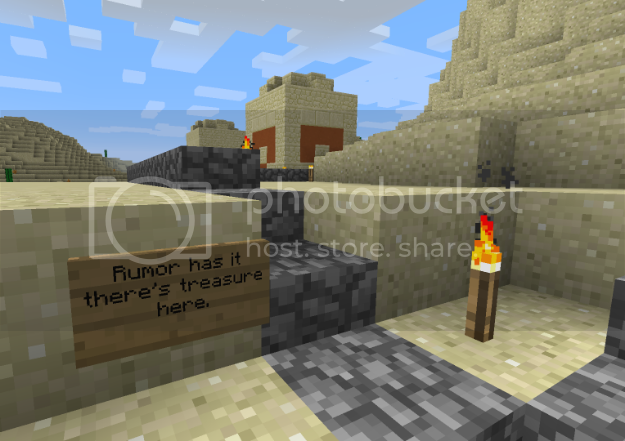 I'll also leave a note in that chest that will contain the challenge, which will be, partly, to build a library in Village #1, and stock it with the books from the extra library in Village #2. The other things that player will have to do are to fix and protect Village #2 and decide what it might need from one of the other villages (there will be a list here, of what they all have, and what they need). Then they will build a road from Village #2 to Village #3, and do the same kind of thing over there: leave a note that will contain the challenges, etc. When I've finished my part, I'll place my bed and sleep at Village #2 and save the game to upload. When the next player goes in, that's where the game will start. When that player finishes, the bed should be moved to Village #3 and slept in, so that it will be where the NEXT player will then spawn, etc., etc., etc. We won't be switching out inventories. We'll just continue with what the previous player left in the inventory, and make use of what has been left behind at previous villages. I've chosen to play in Peaceful and only use Survival mode to get this village fixed up and begin the move onward. That way I don't have to worry about the zombies until the protecting is all done. Then I'll have to test it. Each player may decide whether or not to do it that way, or to sleep outside the village (at least 256 blocks away from one corner of the village), only going to the village in the daytime, until the protection is done. One of the goals for the village is to be sure that it generates its OWN golem. There will be more about that later. Right now I'm posting the pictures, and tomorrow I'll flesh this out better, and post the file, ready for the second player. For now, I'm heading for bed. See you all tomorrow. Wow, if you can find maps with villages pretty close to each other, then this sounds like the file could be kept small enough that you could play, even though there is a lot of travel involved. That's exactly what I was thinking, and why I started experimenting with it. As long as you teleport directly to the area where you want to play, not everything has to be rendered. Then you can play and explore in the area around you, with plenty of resources and other things, as well, without having made the map HUGE! 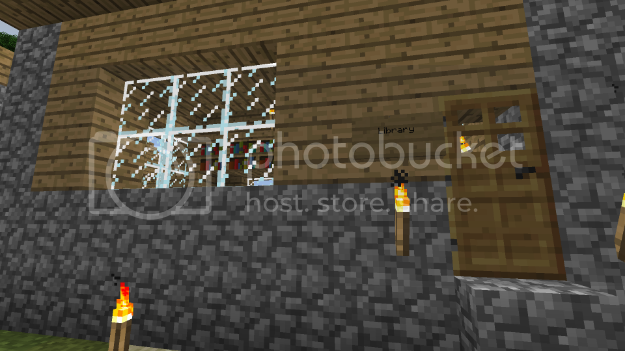 They have other applications, too--including a stronghold finder, and a biome-finder. Unfortunately, they do (at this point) only work for default-generated maps. I tried to figure out the math to make the numbers work for the smaller biomes, but it's impossible for my little brain. I know that when a seed is generated, the biomes are same same types and shapes as in the default, but smaller, and it's exponentially smaller, but figuring that out backwards--even if it worked--doesn't even guarantee that you'd find something where it SHOULD be, because evidently the things that area supposed to be generated aren't "catching" as they should, from the things I've read. I hope they get that fixed, because I really love the smaller biomes! I've developed Village #1 and the map is ready for the next step. I won't share a whole lot here, except for photos, because the next player is supposed to go and investigate to see what has been done there. When I landed in this town (where the world spawn point is set, now), it felt really chaotic to me, though there weren't any HUGE problems (like things sinking down into ravines, etc. Now it's a serene village with a thriving population who have their own iron golem to protect them (as well as the walls and gates I left them with. To find out what you are supposed to do, read the signs and follow directions. There also may be some suggestion signs around the village, that you'll find as you work on it. When you have finished everything in the notes left behind for you, your final task is to create a simple road to Village #3, leave a gift and notes (signs) there for the next player, and leave a bed, which you must sleep in just before quitting and saving the file to upload for the next player. Your notes should tell the next player one thing that will have to still be done to complete Village #2, and the basics of what you feel needs to be done at Village #3 in order to make it a safe, viable place for at least 10 villagers and their (auto-produced) iron golem. This part of the scenario will continue with each player, until all six villages are complete. You will need the list of coordinates for the villages, in order to create your road to the next one. If you want to visit the other villages just to see what they look like, that's OK, but be SURE you don't go there at night, if you are in any difficulty except peaceful. Also, anything in any villages with higher numbers than the one where you land when you enter the game, are off limits to changes. Your village and the ones with lower numbers are OK to use for resources and you'll have to do the task that you are set to do in the one just before you. You may play in peaceful until your village is protected, or you may play in any other mode, as long as you stay at least 256 blocks away from any village at night. Stay in Survival if you like, or go into Creative, or use a mix--whatever feels the most comfortable to you. Just don't let our little guys get killed or assimilated by "the Borg!" There are TONS of resources in this map--underground or in other areas around you. Please try to stay mainly in the line with the villages, though, since rendering areas further out makes the map get larger too quickly. Right now, the zipped download is only 17.4 MB. If you're ready to start, you may now DOWNLOAD THE MAP. NOTE: There is no starter kit for you. We aren't changing inventories this time. You have an inventory to begin with. You may leave that inventory any way you like when you are ready to share the map again. When you need a picture for the way a village looked in the beginning, you may either take your own when you first get there, or use the "img" tags for the ones I uploaded in the first post of this topic. Linda, you did a great job with your village. It looks so pretty now and so well laid out. When I play in a village, I usually stay in normal survival mode, but I just sleep at night every night until I get the village protected. That way I don't have to worry about the poor guys getting killed. How do you make villagers auto-spawn a golem? That's never happened for me. That's true about sleeping for the night. I hadn't even thought of that! That's what I'll do next time, too! Thanks! 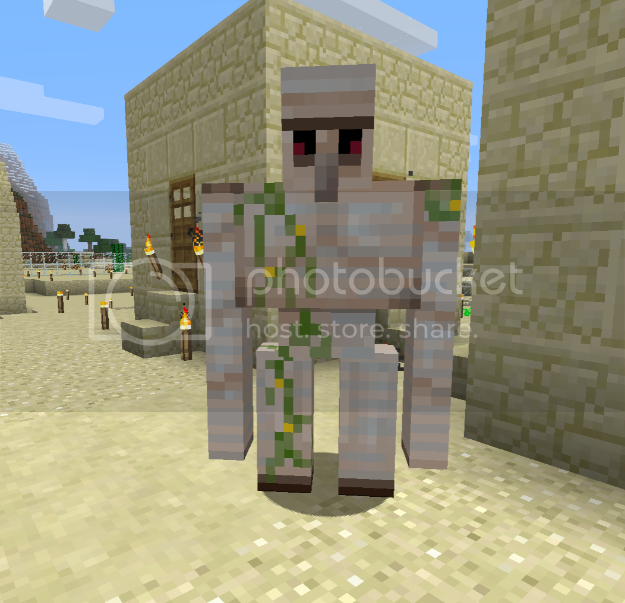 Golems will spawn near the center of a village if it has at least ten villagers and 21 houses. Additional houses beyond the 21st will make no difference as far as golem spawning is concerned, but you will need 29 of them, at least initially, in order to spawn ten villagers naturally (although after that you can cut them back down to 21 if you want to.) However, having additional villagers beyond the tenth will allow more golems to spawn, in increments of one golem for every ten villagers (so 0-9 villagers allows no golems to spawn, the cap is set at zero; 10-19 raises that cap to one, 20-29 raises it to two, etc.) This cap only limits the number of golems in a village at any one time; as soon as one is killed or leaves the village boundaries, a new one can spawn in its place immediately. Additionally, villagers must be "willing" in order to breed. After mating, they will no longer be willing and must be traded with again before becoming willing again. Villagers can become willing by the player trading with them. Willingness is granted the first time a new offer is traded, or at a one-in-five chance on subsequent trades). This will not cause them to immediately seek out a mate, however. 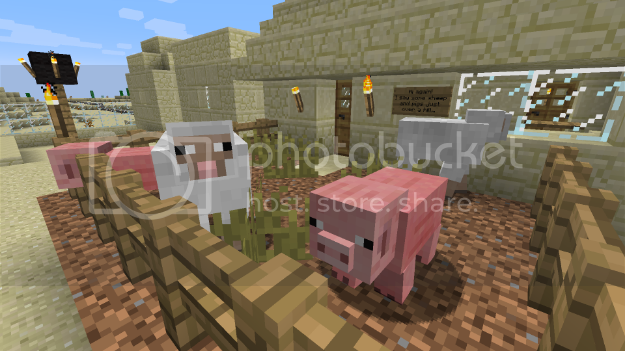 Villagers can also become willing by having either 3 bread, 12 carrots or 12 potatoes in their inventory. Farmer villagers will throw harvested crops at villagers, allowing them to pick them up to obtain enough food to become willing. This has all been updated for 1.8, but what someone didn't know, is that you can increase their willingness by feeding them yourselves! If your villagers aren't getting together and breeding, but they should be, and you don't have the right goods and/or time to be trading, trading, trading with them, you can have bread, potatoes (raw), and carrots in your inventory, and when you're close to one of them (preferably close to a couple who will get happy quickly), you can throw food at them. If their slots aren't full already, they will absorb the food, and when their slots are full, they will get willing. There's more in that article about how to force the game to read the new stats when you add doors, take away doors, or want to jump start the breeding. Mainly it's that you can exit the game, then come back in. If that doesn't work right away, you can go more than 256 blocks away, SAVE, then go back to the village, and usually that will reset all the counters. I just remembered that another thing to note about the doors, is that it is the VILLAGERS who initiate the door count. As soon as a villager uses a door, that door will be counted in the next round of ticks. If a villager never uses a door, it will never be counted, no matter what. So you can lure a villager close to an outlying door by feeding him or trading with him, after which he will be prone to following you around. If he's outside the door, start trading with him, then stop, go inside, and wait. He'll generally follow you in. Bingo...the door is recognized in the next round. Okay, since I've just finished the other challenge, I'm going to start this one! I'm sure I'll have questions. You said to destroy one of my libraries. Can't I just keep them both and build a whole new library at the first village? Also, my village already has over 10 villagers to start with. Why isn't there a golem? Sure! you can have your village just donate all the materials for a new library and send a crew to build it! I just figured it would be easier to donate the whole library--bookshelves included--without having to take the time to wait for new supplies to be gathered. In order to get the golems to generate, you'll have to start adding doors. The village has to go into it's "produce a new generation of villagers" mode, in order for the game to take note and realize that a golem needs to be generated. That's when it begins counting the number of doors vs. the number of villagers, and the stats begin to be tallied. If there are already 10, then as soon as that round of ticks has finished, the golem should be generated. Right now, your villager production is capped, due to the quantity of existing valid doors--both of which were auto-generated. So the game doesn't yet know that a golem is required. You may have to quit and go back in, in order for him to actually be generated and rendered, at that point. Okay, I'll throw some door on and see what happens. Okay, I think I've finished all the various challenges. Since they were listed in so many places I might have missed something. So if I did, let me know, Linda. First, I got some walls up and some lights down to protect the village. I slept at night so I didn't have to worry about mobs. I had 11 villagers to start, but there wasn't enough doors to produce a golem so next I started adding doors to the existing buildings. Pretty soon I got a golem. On the way over to Village #1 to meet my challenge there, I saw this sign. The rumor was true at one time, but not anymore. My challenge at Village #1 was to build a library. I built one from scratch using the blueprints that the Wiki has. I made the bookcases instead of destroying the second library in Village #2. I have to say, the library looks a little weird to me from the outside, but the inside looks just like it's supposed to. Don't know what that's about. I almost missed the challenge about getting some pigs and sheep. I didn't see the sign until I was lighting up the village. This is what Village #2 looked like when I left it -- all safe and lit up. I made a road out to Village #3 and left a gift, challenges for Village #3, and a challenge for Village #2. I think I got everything done. But let me know if I didn't. You did a wonderful job...those extra signs were just there in case you found them. They could have been picked up on by someone later...or not at all. There also may be some suggestion signs around the village, that you'll find as you work on it. Sorry...I shouldn't have been so confusing. You got your golem! Woot! Picking up the map. If anyone else wants to jump in here and play it before I start it (which will be some time yet, since I have two or three others in line to do first), please do so! Since I've now re-uploaded Into the Woods, I decided to check out what you left in Village to Village. I love your message to the Mayor! Were you amazed when you found what Village #3 looked like? I was!